FIVE years after the death of his dad, there are times when young Robert Irwin is inconsolable. But today, the seven-year-old will be the proudest kid on the planet as he joins his mum Terri and older sister Bindi to officially launch the Africa exhibit at Australia Zoo, fulfilling the first stage of a huge dream of the late Crocodile Hunter. For the first time, the Irwins have given a public insight into their private getaway near St George, sharing their weekend out west with Sunshine Coast Daily photojournalist Nicholas Falconer. In his exclusive reports, Terri talks candidly about life after Steve, her conservation hopes for the future, and the peace she and the children find in a place she calls Paradise. ROBERT Irwin waits...and watches ...and waits...and watches, then pounces. "Gottim", the seven year old cries as Ranger Barry lifts up the last sheet of discarded corrugated iron in a pile at the family's south western Queensland property. A baby Bynoe's gecko is his temporary friend and he delights in showing us the change in colour of his tail, informing us how it was probably lost in a fight for survival under the sheet. The comparisons with Steve are inevitable. He's so much like his dad. A mop of blonde hair, two missing front teeth and a Gondwana land of freckles on his cheeks which part like its namesake when a smile happens - every mother would want one like him. 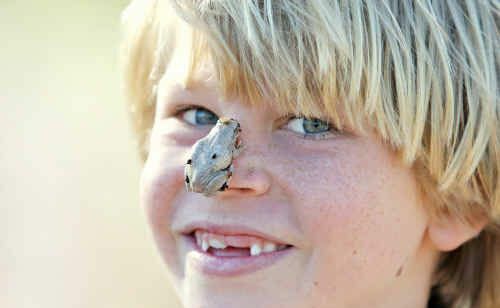 Robert Irwin already knows more about Australia and its wildlife than most of us ever will. One week ago the family was at Cape York in crocodile country, last weekend he was at the family retreat near St George, today he will be at the Zoo and after that in Hollywood while his sister Bindi is filming some TV shows. Robert is home schooled for a few hours every day and, as Terri says, it was one of the best decisions she ever made - it was one of the last things Steve insisted upon. "If he was in regular school he would be the bored and naughty kid. His reading ability is Year 7 but he is doing Year 5 work, three years ahead of regular schooling. Robert does not stop for a second. He is often riding his motorbike, climbing anything that is still or jumping around the lounge over couches and tables with two plastic pistols in his hands. "Are you okay Robert?" Terri asks as he comes a cropper sliding onto the wooden floorboards one night. I'm okay mum, I was just trying my tranquiliser (make believe) guns on some tigers but I slipped and they got away,'' he says.